Welcome to our 2018 Winter Living Room. Winter has always appealed to me, both as a season and as a decorating opportunity, because Winter is actually a bit of a ‘free for all’. There are no rules, or parameters that need to be followed. So when the new year arrives, and the calendar shows January, I feel free to pick and choose from all the other seasons. You will see that I have brought in pictures from Fall, pine cones and cranberries from Christmas, and seashells from Summer. 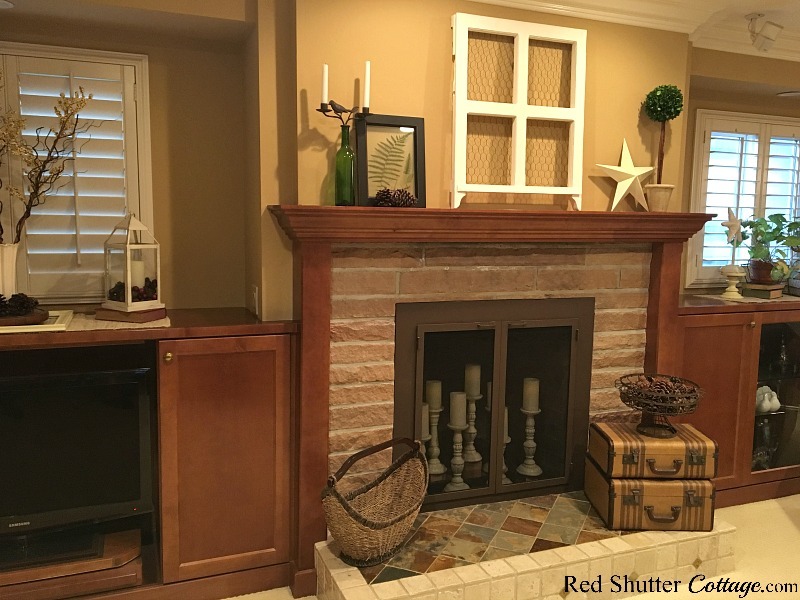 I try to combine these various elements to create a look that conveys a welcoming warmth and cozy relaxation. 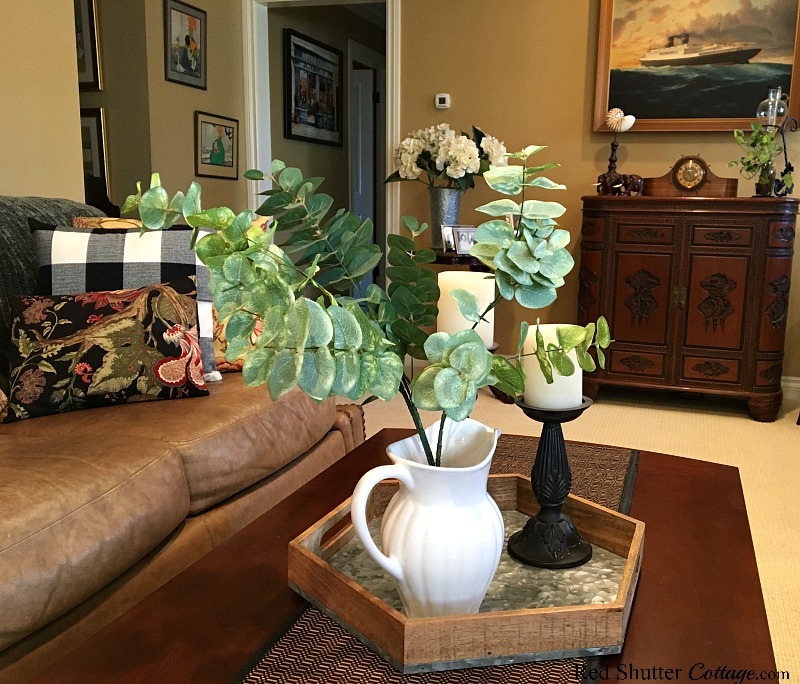 My first priority in creating a Winter living room is to create a little breathing space. After all the colorful effusiveness of Fall and Christmas, I am ready for a little white space. 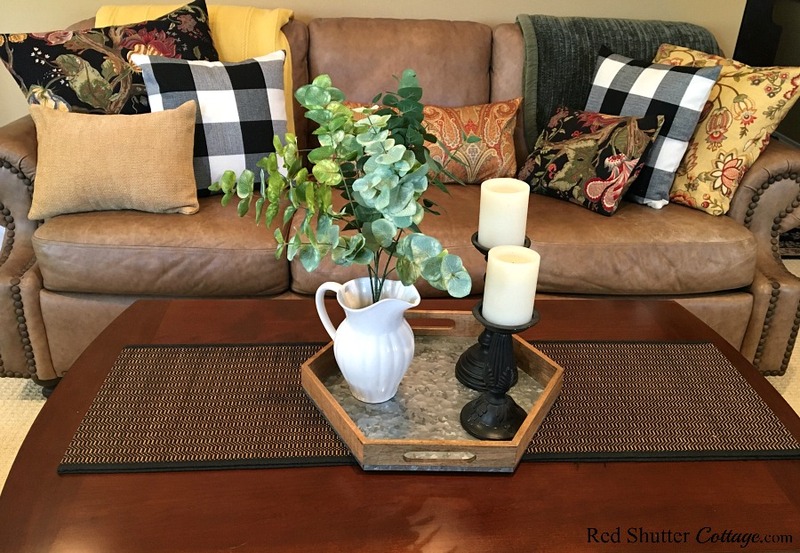 As I was putting my 2018 Winter living room together, it almost felt like I was under-decorating, but I held fast against the urge to “fill this in a little more”. It still jars me a bit to see spaces that seem a little bare! The mantel is my first focus. I left the window up from Christmas and then turned my attention to the sides. I kept the color range simple: wood/brown, ivory and green. On the right, I placed my tall topiary and a star. 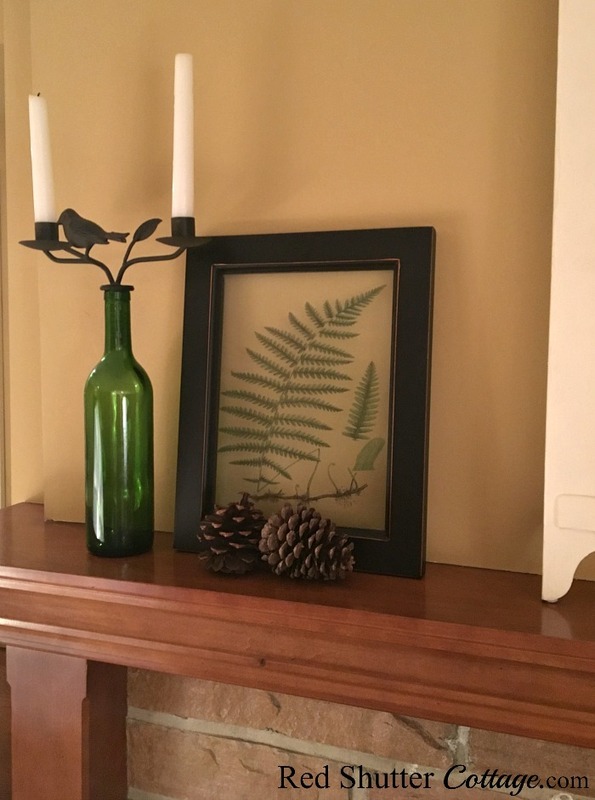 On the left is wine bottle holding a candle holder, a glass green fern print and a couple of pine cones. 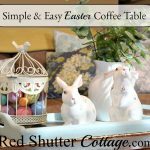 For the coffee table, I went simple with a very basic runner, a wood and metal tray holding a white pitcher and candles. 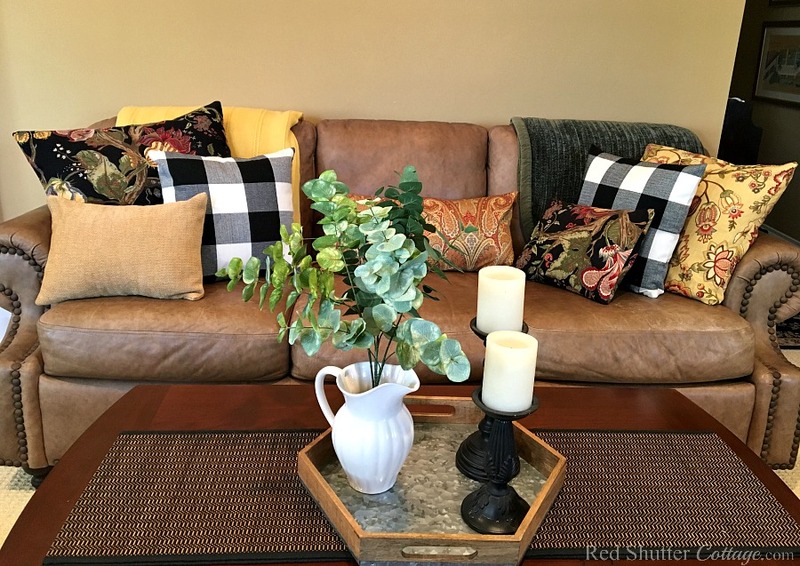 Because it’s winter, I focused on darker colors and richer textures on the pillows for the couch. Clearly, buffalo check is a favorite! I have been wanting to sew pillows with this black floral print for quite a while, and this seemed the perfect time of year to do that! 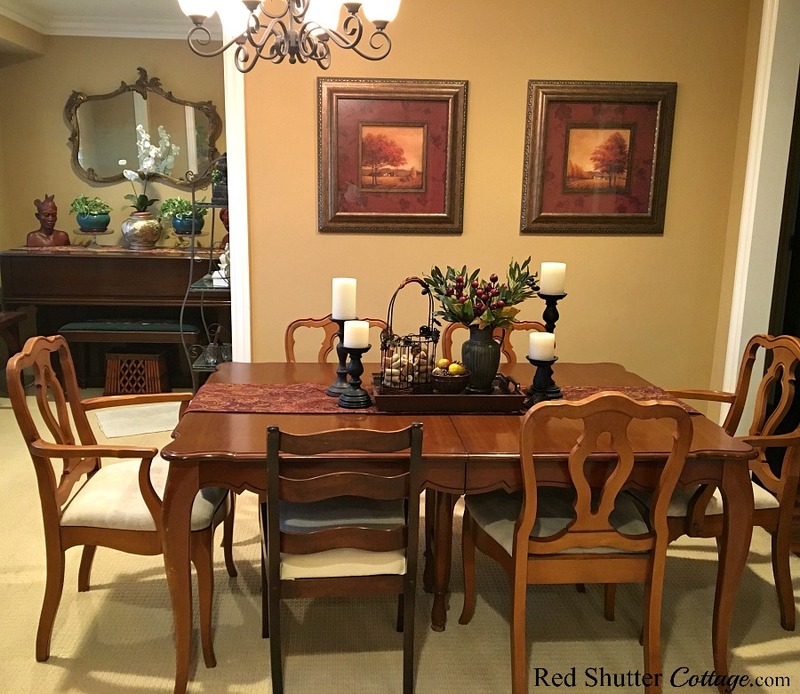 The dining table got a little bit more attention and accessorizing. 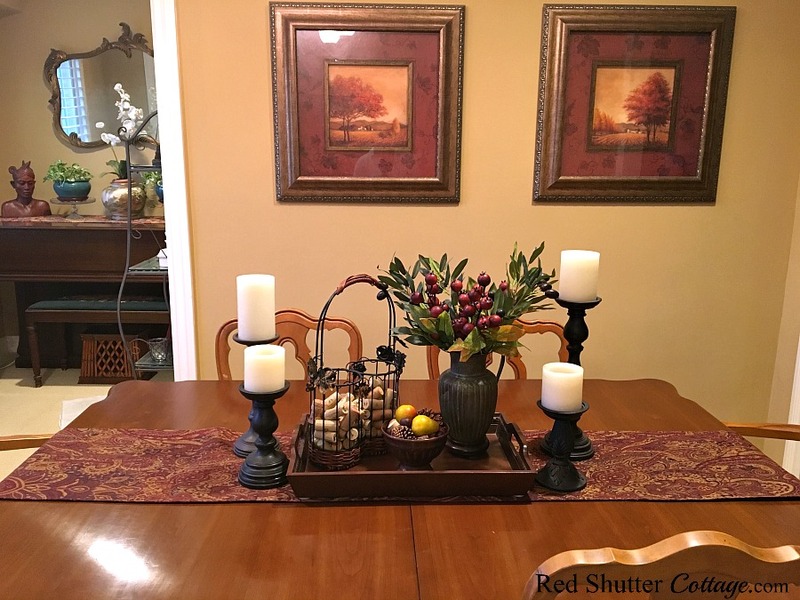 But, as you can see, I borrowed some elements from Fall (pictures on the wall, and the runner), Please read this post that tells that story of the process I went through to finalize the dining table vignette. At one end of our dining table area is a table that sits in the window. 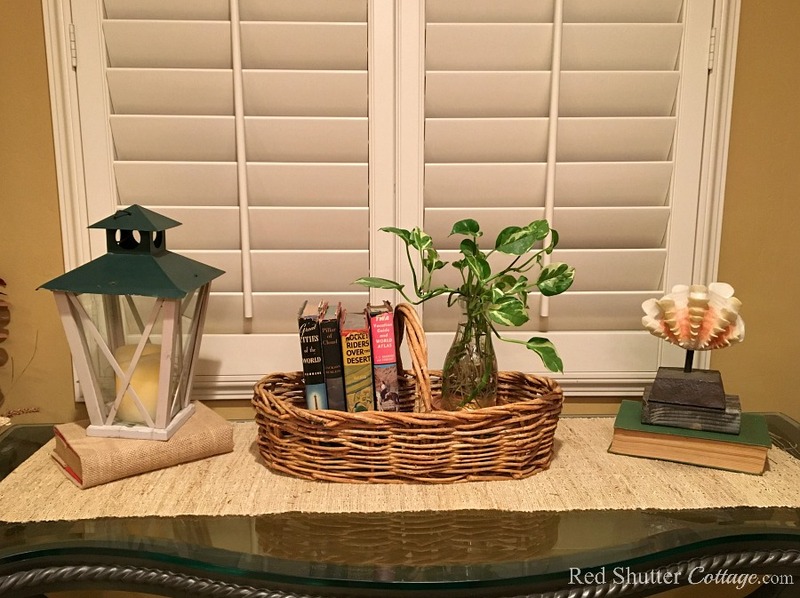 Again, drawing from other seasons, I filled this basket with books and pothos vines and included a shell on a stick and my favorite garage sale lantern. This picture is taken standing in the kitchen, looking over the dining table to the window table. Let me take you back to the fireplace and mantel. You can see (just barely!) 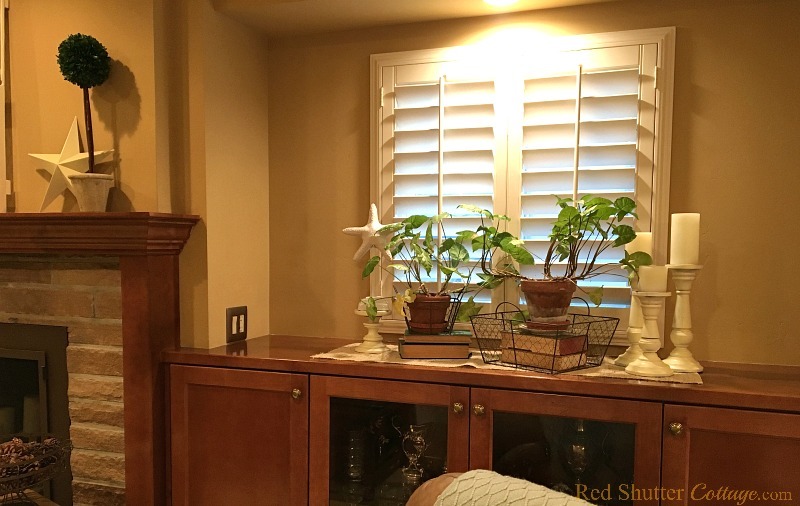 that there are built-ins on either side of the fireplace, with countertops in front of the windows. 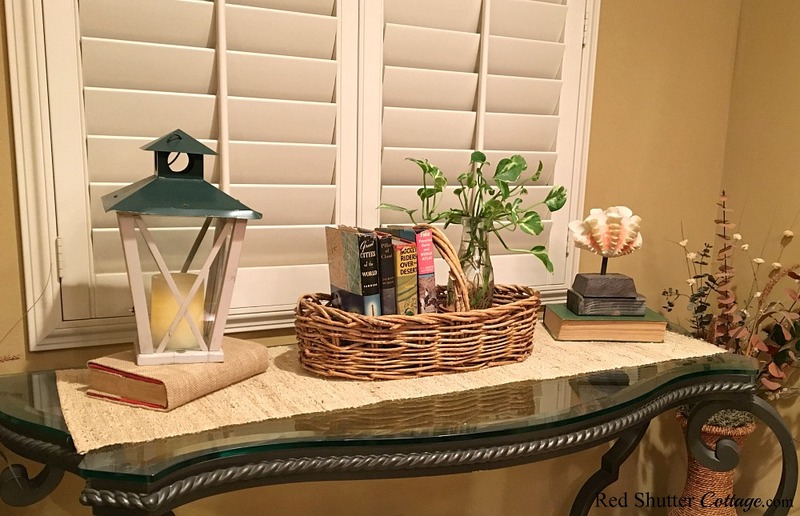 Let me tell you – for years I have struggled with decorating these countertop spots. 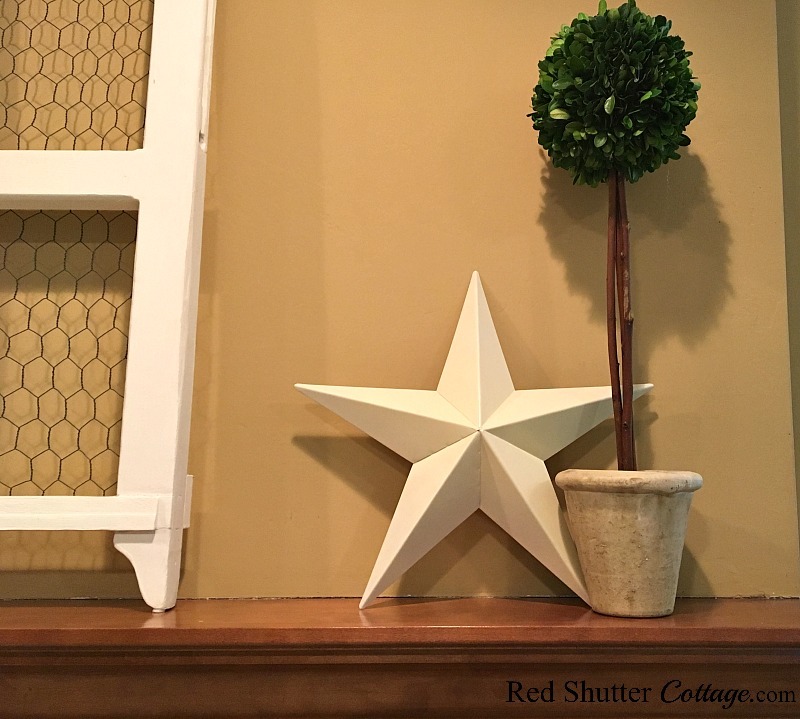 For every season that I decorate my living room, I feel compelled to create something special in these two spots. And I am never happy with it. Additionally, I realize that when I have decorations on the mantel, the coffee table, the couch, and the dining table PLUS these two counters, it’s too much. It’s too busy. There’s too much chatter going on in the room, and nothing is standing out. These two spaces are wide and tall, so I need something with a sense of width and height. (Behind those slightly closed shutters is a view of the not-so-pretty house next door.) I didn’t want bulky or heavy, I wanted light and airy. And most importantly I wanted a permanent display; something that can fill that spot for every season. And I think this will work. 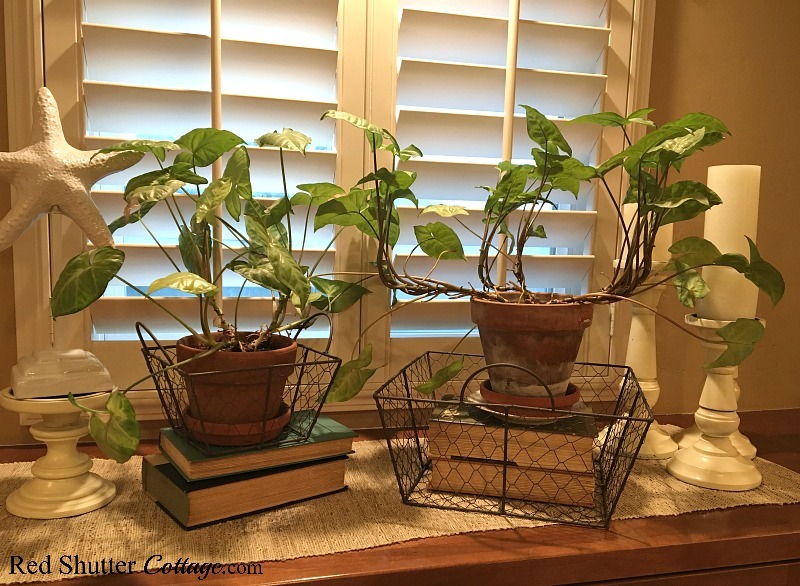 When I begin to focus on Summer decorating, I can sprinkle some shells in with the plants. In the Fall, I can spread around a few pumpkins and gourds. And at Christmas, a few groupings of pine cones and some berry garlands will make it festive! I have not yet had an epiphany for how to treat the left-hand side. 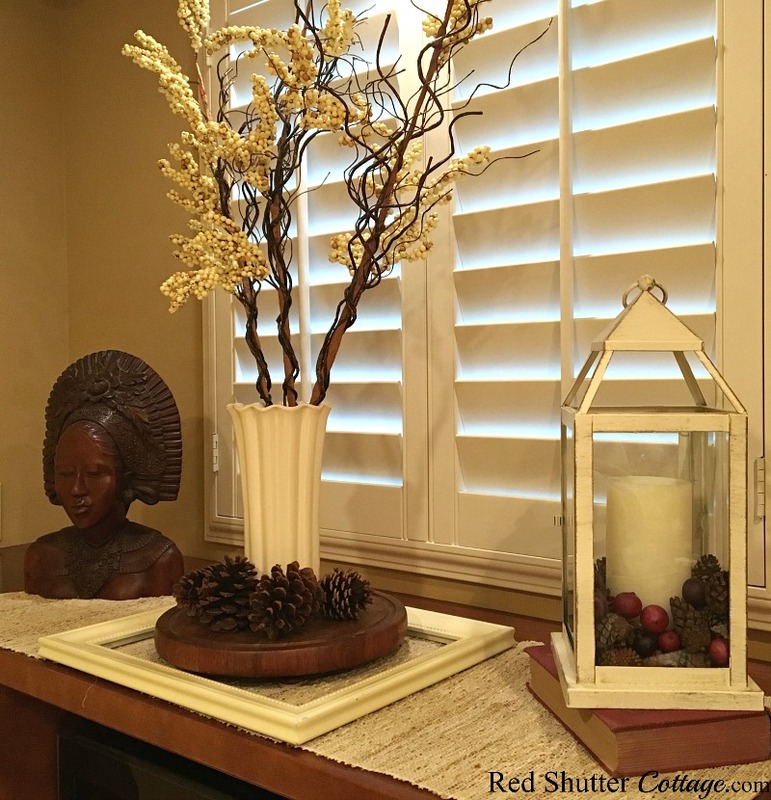 For now, I have filled a garage sale vase with some white berry branches from Hobby Lobby. I laid down a frame, put the vase on a (fancy!) wood cutting board, and added a few Christmas-y pinecones. The lantern is from Pier1. The carved wooden bust is from the Far East. It is one of 3 that my Father brought back while serving in the Merchant Marine during WWII. This completes the tour of our 2018 Winter Living Room. 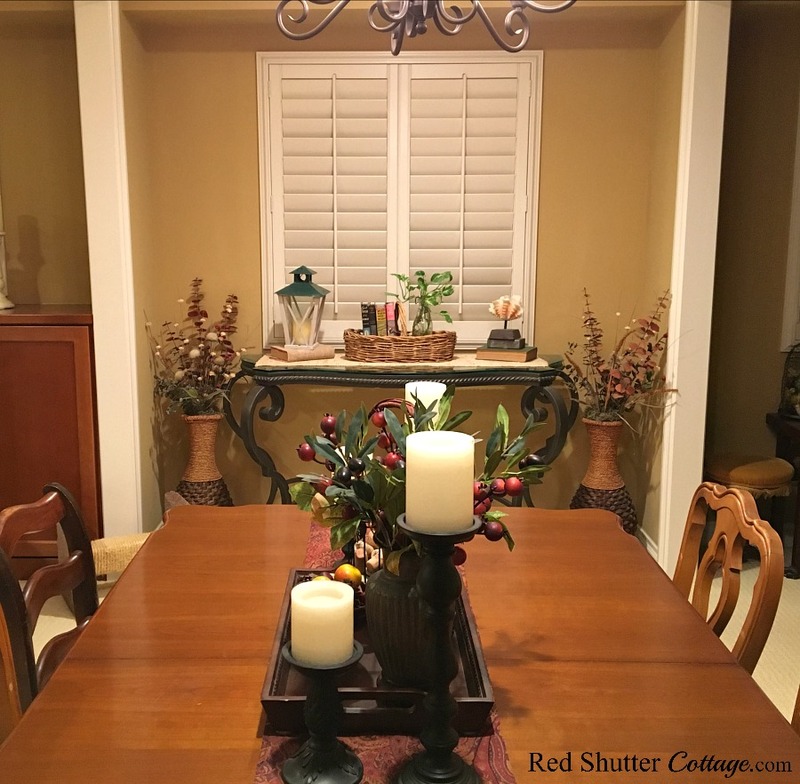 I understand that after taking down the Christmas decorations, your rooms may feel a little bare and blank. 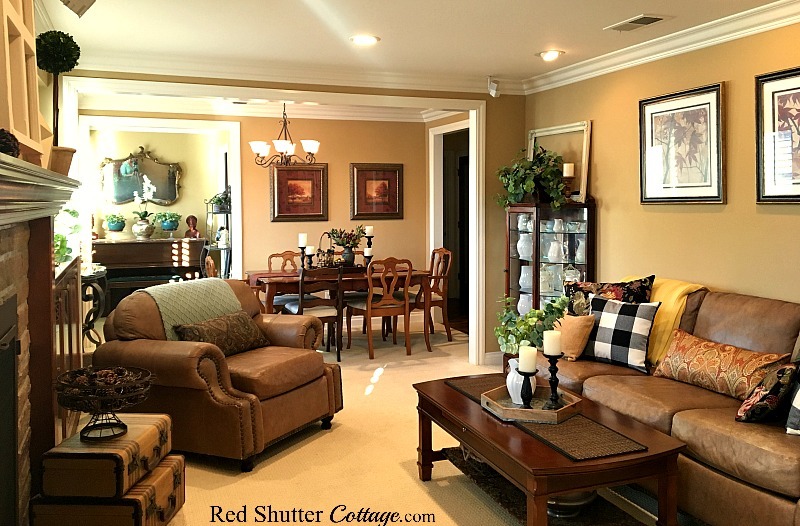 But decorating for Winter can also be a time for creating a room that exudes comfort and warmth. Winter is a very flexible season – feel free to pull in your favorite colors, textures, and accents from all the different seasons. I hope this tour has sparked a few ideas or a little inspiration to help make that happen! Your room looks great – not overly, or underly (yes, I just made that word up) decorated. Thank you, Janis! ‘Underly’ is a great made-up word! I am finally starting to get used to the open space, and am very much liking it! 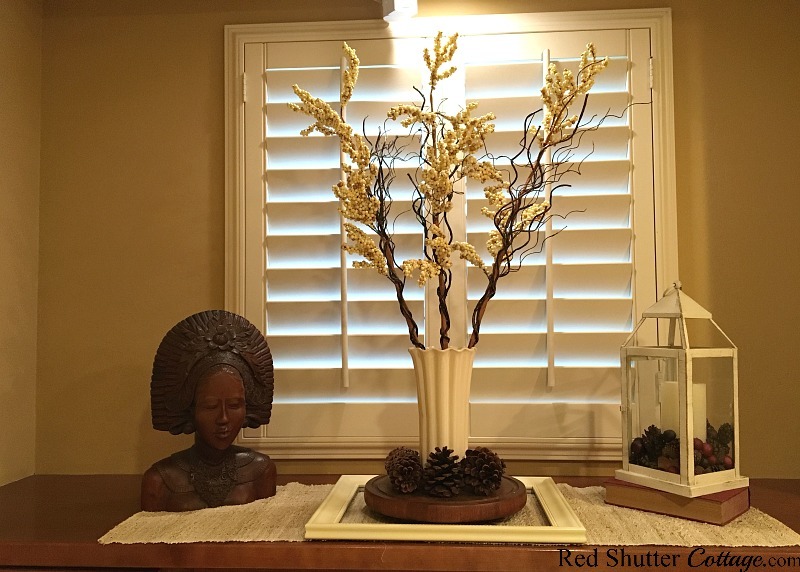 Kristine you winter decor is wonderful! 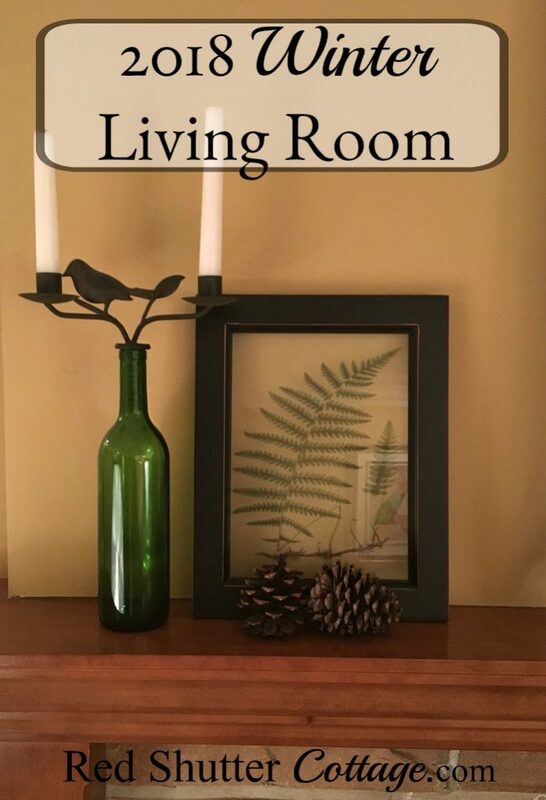 Just the right touch of every season and your bookcase beside the fireplace look perfect!! Thank you for joining us and sharing at Create and Celebrate!! Thank you Susanne! I know my winter is so different from yours, but cozy and inviting are a universal language! Thank you for hosting Create & Celebrate! 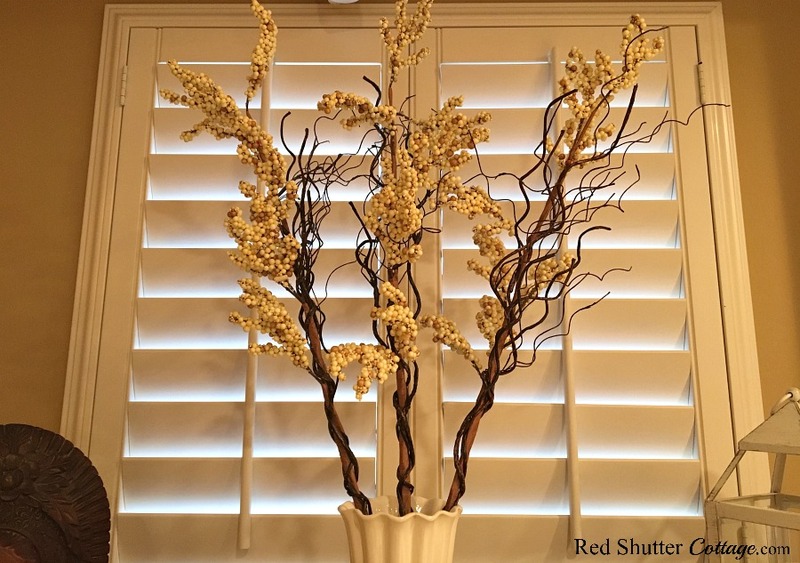 Your room looks extraordinary – not excessively, or underly (truly, I recently made that word up) designed. Thank you Jessica ! I think ‘underly’ is a great word! I truly wanted it to feel inviting and comfortable. Thanks for stopping by.